It’s lively and colorful, but The Secret Life of Pets is hard to get excited about. Without any breakaway sensations, so far this has been a bummer of a summer at the movies. Finding Dory, while flooding the box office, suffers from a floundering narrative. Nearly great were The Legend of Tarzan and The BFG, both packing thoughtful storylines, but they haven’t made waves with wider audiences. 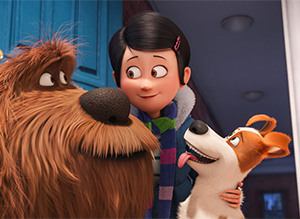 Now The Secret Life of Pets is another ho-hum entry in the summer movie derby. It’s actually a little bit more fun — and interesting — than Finding Dory, but that’s a minor relative improvement. Both skew toward younger audiences; neither truly lives up to their brand and neither offers much to think about afterward. While Dory enjoys the strength of Pixar’s reputation, these Pets have the mighty Minions in their corner. Pets’ stable of two directors and three writers all have ties to those quirky, funny little yellow walking, talking Twinkies. All five have been involved with either the Despicable Me or Minions movies. And the Minions make a cute little cameo at a party as the movie lurches to its conclusion. The Secret Life of Pets starts cute enough. It’s all about dogs and cats and those silly humans who love them. But after the first few minutes, fears set in there’s nothing more to it than cute human and pet interactions. It seems like it’s going to be a looong 90 minutes. As it turns out, there is a bit of story. Katie (Ellie Kemper, TV’s Unbreakable Kimmy Schmidt) is a New Yorker with a thing for stray dogs. Her first love is Max (Louis C.K., TV’s Louis) and they’ve established quite a relationship, one that’s clearly a bit more romanticized in Max’s view. He can’t imagine Katie being able to survive without him. Then Duke happens. Duke (Eric Stonestreet, TV’s Modern Family) is a big, fluffy Wookie-like beast of a dog who’s adopted by Katie with the best of intentions. He’s supposed to be Max’s new playmate and friend. Instead, there’s an ugly rivalry that unfolds. That rivalry not only reveals the titular secret life of pets, it also delves into the nasty, cutthroat underworld of New York’s abandoned pets community. Once the movie gets rolling, it’s a case of anthropomorphism run amuck. The fun really kicks in with the introduction of a cute little bunny named Snowball (Kevin Hart, Central Intelligence) along with a menagerie of snakes, lizards, cats, tarantulas and all other manner of “flushed pets” who form his gang. Snowball used to be a magician’s best friend, a key component of his magic act. Then cute little bunnies became passé in the magic scene. That turn sent Snowball to the dark side of pet life — and led to his rise as a gang leader in the sewers. At turns, he’s a cutesy little ball of fluff then he’s a raging maniac of pure, unbridled and unleased pet aggression. It all serves as passable entertainment that does a modestly decent job of keeping all ages entertained. In particular, Max and Duke find themselves in a hot dog factory and the result is a wildly hallucinatory out-of-body fantasy for the duo. More of that kind of out-there inventiveness could’ve lifted Pets to a higher level, but it ultimately prefers to stay close to the comfort zone of standard animated fare. And even with the creative clout of the Minions in its corner, the goings-on never quite reach their same level of cross-generational appeal. Over 63% of them check Google first! We feel that you could use a little boost at Google and YellowPages. Most customers avoid leaving a review unless they have a BAD experience to share!